This foundation stone of the Cathedral of Saints Eunan & Columba was laid on 6th September 1891 by the then Bishop of Raphoe (and later Cardinal and Archbishop of Armagh), Patrick O’Donnell. 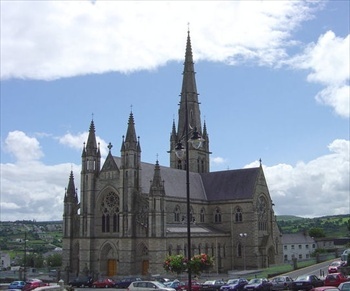 He had been appointed as Bishop of Raphoe three years earlier and he brought to fruition the aspiration of many of his predecessors – to build a Cathedral Church in Letterkenny. A statue in his honour stands in the Cathedral grounds as a mark of gratitude for his work. The Cathedral was designed by William Hague of Dublin, and built in Mountcharles stone. It measures 171 feet in length, 100 feet in width (at the transepts), and 72 feet in height. The spire measures 240 feet in length. Above the main entrance to the Cathedral stand the statues of its patrons, Saint Eunan and Saint Columba. The coat of arms of the then Pope, Leo XIII, and the then Bishop of Raphoe, Patrick O’Donnell, are also to be found above the main entrance. On the ceiling of the sanctuary are images of Our Lord and the Apostles. The Mayer firm of Munich, Germany, made the windows on the sanctuary and they depict thirteen scenes from the life of Our Lord. The main altar incorporates an Irish carved representation of Da Vinci’s The Last Supper. All throughout the Cathedral are representations, either carved in the stonework or painted on various parts of the ceiling, of the various saints associated with each parish in the diocese. These representations are one way of expressing that the Cathedral is the diocesan church. The pulpit and altar rails were made by the Pearse firm of Dublin (founded by Padraig Pearse’s father). The pulpit has within it carvings of the four Evangelists, Isaiah the prophet, and of the Four Masters of the old abbey in Donegal Town who penned The Annals of the Four Masters. Within the altar rails are carved symbols of the passion of Christ. Of note in the main aisle of the Cathedral is the Columban Arch that depicts scenes from the lives of Saints Eunan & Columba. Also noteworthy in the main body of the Cathedral are the many fine windows, some of which are the work of Michael Healy. – Adapted from material found in “Saint Eunan’s Cathedral” by Graham Harrison.